So what is ‘humane education’? Now that we have this amazing humane education blog some of you might be wondering … what is humane education? Humane education is the teaching of respect, kindness and compassion in relation to animal welfare, social justice, and environmental issues. It can bring forth the desire and capability to live with compassion, integrity, and wisdom and can give the knowledge and skills to take action in meaningful ways that allow humans to live in a kinder world. On a smaller scale, humane education teaches people how to properly care for and respect their companion animals, such as cats and dogs, and all forms of animal life. It can be used as a tool to explain the consequences of irresponsible behavior and motivate people to see the importance of living creatures other than ourselves. And how can this help our teachers in the classroom? More than ever we are realizing the connection between child abuse, animal abuse, and violence towards one’s peers. The need to teach kindness and empathy through guided humane education programs, while still connecting with the Texas Essential Knowledge and Skills, is greater than ever. Humane education is the only educational method that recognizes how powerful the connection we have with nonhuman animals is and allows us to use that connection to share our humanity with others. Can we get some authority on this? Humane education can be integrated into regular classroom education, adding more meaning and compassion to language arts, math, science, social studies, health, and more. If you are interested in having our humane education department come to your school to present on a variety of topics please e-mail education@houstonspca.org or call 713-869-7722 ext. 143 to schedule your presentation today! Categories: Paw Pals Program, School Programs | Tags: Animal welfare, Compassion, Education, Humane Education, Organizations, School, TEKS, Texas Essential Knowledge and Skills | Permalink. Calling All Girl Scout Troops! Here at the Houston SPCA we love connecting with our local community. One way we do that is through our Girl Scout Paw Pals Patch Program – say that 5 times fast! Part of the Girl Scouts of America’s mission is to develop a scout’s character, which happens to be a major component of humane education. Learning about and seeing an animal can help enhance the character building experience. Whether you are a Daisy, Brownie, Junior, Cadette or Senior, our patch program can strengthen the connection between scouts and animals. We have a variety of activities for each level of scout to be able to obtain our unique and exclusive patches. 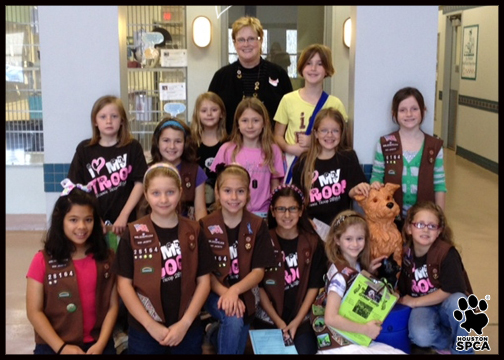 Girl Scouts have the opportunity to tour the shelter and see our animals as part of the patch program. We normally have troops of 5 to 15 people tour the shelter with their troop leader and adult chaperones. Daisies, Juniors, Cadettes, and Seniors can also choose to do a lesson about animal behavior and safety given by our humane education volunteers as part of the Paw Pals Patch Program. We can schedule the program during the week (M-F, 12:00 PM – 4:00 PM) or on the weekend (Saturday 10:00 AM, 12:00 PM or 2:00 PM and Sunday 12:00 PM or 2:00 PM). Learning about animal behavior is a key aspect of our patch program and after the scouts have earned their patches they will be able to determine how to be safe around animals they do not know and how to enhance their experience at home with the animals they do know. You might also find a furry friend at the Houston SPCA to help with your scouting adventures! Categories: Paw Pals Program | Tags: Brownie, Girl Scouts of America, Houston, Houston SPCA, Humane Education, Junior, Organizations, Recreation, Scouts | Permalink.